Step 1: Select a MIDI file. Step 2: Choose tracks from file to include (if it is a Type 1 MIDI file, as 95% of the files on the internet are). Preview individual tracks to pick the best ones and most representative ones to use. Step 3: The converter will automatically dissect the chosen tracks and attempt to re-merge them into a maximum of four channels. Next, it will use a new form of the Longest Repeated Substring family of algorithms I wrote to try to compress the song, and return instantly-compilable ASM of the compressed and uncompressed song, ready for playing in mobileTunes 3. Needless to say, not every song generates great-sounding on-calc music, but the converter strives to achieve the best possible results with no more than a few seconds of effort from the end-user. To fine-tune songs, you can easily try a different subset of the tracks in the original MIDI file and re-generate the compilable ASM. The mobileTunes 3.0 converter, which I first wrote about five and a half years ago when I was still in high school, can understand and decode any Type 0 or Type 1 MIDI file, with any number of tracks. At one point, most available files were Type 0, but as a rough estimate from observation now puts the share of more complex, multi-track Type 1 files at 95%, the converter's ability to flawlessly handle such files greatly expands what would otherwise be a severe limitation on which songs could be used without tedious modifications of the songs before conversion. The layer-merging algorithm ensures that the result will be as true as possible to the original; one particular Zelda theme song I tried was properly merged from 40 tracks down to 4 channels of quadraphonic sound by the converter with zero notes lost. The format generated for assembly allows easy insertion of metadata, and offers a single value to change to speed up or slow down the resulting song as desired. Feel free to head to the converter, give it a try, and post bug reports in the attached topic. Be patient with songs; if one doesn't work well, try a different set of tracks from it, or a different file. The best performance from the player is usually achieved when percussion tracks are omitted. I have a question though about the chords. Each of the 4 channels is a monophonic frequency correct? If the chord is more than 4 notes, how do you decide which notes to keep and which ones to discard? That would be nifty, I'd quite like to see that. I try to show preference to the initial channels that had the most notes, on the assumption that they are the most important. Of course, there are some situations where that is a poor choice, hence the occasional need for manual tweaking afterwards to make your songs sound as you'd like. It's pretty straightfoward; all you need is notes.inc from the mobiletunes 3 zip, and SPASM, TASM, or Brass. You might need my BinPac8x tool as well. Let me know if you need any help with this. Were you suitably happy with the songs it came up with? Not a problem. It turned out that part of the problem is that I forgot I forced it not to accept MIDI files over 100KB, because such files will put excessive load on my webserver while they're being parsed and processed. Thats fine, I can understand that. Did you get a chance to try out assembling one of the songs yet? Let me know (and everyone else, please do the same) if you have troubles. Ugghh, I dont know which is the easiest assembler to use? They're all pretty straightforward. If you decide to wait until I update the Doors CS SDK, you could simply grab that and use it, but it'll be several weeks at least until I get to it. can you, or anyone, put http://www.vgmuseum.com/mrp/multi/Music/cv1-%20Poison%20Mind(NICH2).mid through the converter, compile it, and send it to me? 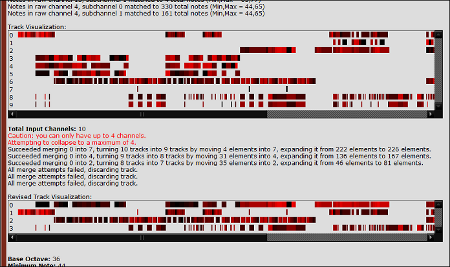 I'm afraid that that song (a 30-"track" Type 1 MIDI) didn't work too well. Am I correct that the song is Church of the Poisoned Mind? I checked out some alternative files, which seemed to work very nicely. If you're dead set on that, I'll try working with it a bit more. OK, I'll see what I can do, would you mind reminding me later? Wait, will MT3 have the same problems as calcmod did, remember the little problem I had with the 3.0-2.5 converter? I tried converting this myself, and I'd have to agree with Kerm that it doesn't translate as well as you are probably hoping. It works amazingly in the mobileTunes converter. Here's the result with the only different being all the notes in octave 4 moved to octave 3 for the sake of sounding a little less shrill. It was a single find/replace with the power of Regex in Notepad++. Tell me what you think, Qazz (also Quigibo). Yeah, mine was 12 tracks (I have type 1 working in my converter now but I still need to fix a few bugs). I probably could have made it a little better if I removed some of the tracks but I just dragged it into the converter without any editing. That one sounds pretty good Kerm. Definitely the lower octave helps with the base. Thanks quigibo. I'm thinking of attempting some of the other MIDIs on that page to see how they turn out. © Copyright 2000-2019 Cemetech & Christopher Mitchell :: Page Execution Time: 0.162941 seconds.